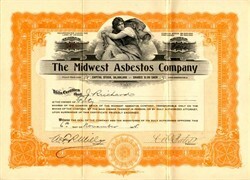 Beautifully engraved certificate from the Midwest Asbestos Company issued in 1915. This historic document was printed by Goes and has an ornate border around it with a vignette of an allegorical woman. This item has the signatures of the Company's President and Secretary and is over 91 years old. Asbestos (a misapplication of Latin: asbestos "quicklime" from Greek ἄ�������: a-, "not"; sbestos, "extinguishable") describes any of a group of fibrous metamorphic minerals of the hydrous magnesium silicate variety. The name is derived for its historical use in lamp wicks; the resistance of asbestos to fire has long been exploited for a variety of purposes. Asbestos was used in fabrics such as Egyptian burial cloths and Charlemagne's tablecloth which according to legend, he threw in a fire to clean. Asbestos occurs naturally in many forms (see below); it is mined from metamorphic rocks. When asbestos is used for its resistance to fire or heat, the fibers are often mixed with cement or woven into fabric or mats. Asbestos is used in brake shoes and gaskets for its heat resistance, and in the past was used on electric oven and hotplate wiring for its electrical insulation at elevated temperature, and in buildings for its flame-retardant and insulating properties, Abestos' tensile strength, flexibility, and resistance to chemicals. The inhalation of some kinds of asbestos fibers however causes various serious illnesses, including cancer, and thus most uses of asbestos are banned in many countries. Fiberglass has been found to be a suitable substitute for thermal insulation and woven ceramic fiber performs as well as or better than asbestos as an insulator of high-temperature electrical conductors. Most respirable asbestos fibers are invisible to the unaided human eye because their size is about 3.0-20.0 �m in length and can be as thin as 0.01 �m. Human hair ranges in size from 17 to 181 �m. Fibers ultimately form because when these minerals originally cooled and crystallized, they formed by the polymeric molecules lining up parallel with each other and forming oriented crystal lattices. These crystals thus have three cleavage planes as other minerals and gemstones have. But in their case, there are two cleavage planes that are much weaker than the third direction. Thus when sufficient force is applied they tend to break along their weakest directions, resulting in a linear fragmentation pattern and hence a fibrous form. This fracture process can keep occurring over and over until they have been broken down to their smallest unit dimensions. For this reason, one larger asbestos fiber can ultimately become the source of hundreds of much thinner and smaller fibers in a normal environment over the course of time. As they get smaller and lighter, they become more mobile and more easily entrained (wafted) into the air, where human respiratory exposures typically result. The released fibers being heavier than air will eventually settle in quiescent conditions only to be resuspended over and over again by any kind of activity or air currents over a period of time. This cyclic re-entrainment has consequences. Consistent with the tenets of the Second Law of Thermodynamics, the smallest sizes of easily mobile asbestos fibers move away from their initial source location in an ever-broadening manner. They disperse both by simple spontaneous airborne diffusion and through mass transport of the fibers. This latter is an energy-driven process that can occur through directed air currents or by "pickup and release" along a pathway of directed movement by persons, mechanical equipment or vehicles. For these reasons, asbestos contamination does not tend to remain localized at its initial release point but will eventually spread throughout all available accessible areas of buildings, even into areas that don't have their own asbestos-containing products. Eventually asbestos from virtually all products that were manufactured from this mineral will invade each and every space within an affected building. This is because during the lifecycle of each asbestos product, microscopic fibers and larger particles or pieces of these products are typically produced during their residency. The lifecycle of an asbestos containing product begins from the initial delivery of the product to the building, followed by its installation, normal usage forces, age-related deterioration, physical or chemical damage that often occurs, to finally its removal either for replacement or demolition. Any small impact or damage to a typical asbestos containing product can easily release billions to trillions of fibers of asbestos into the immediate environment which then add to the pool of similar fibers and particles from other asbestos containing products within that building. Friability of an asbestos containing product means that it is so soft and weak in structure that it can be broken with simple finger crushing pressure. Friable materials are of the most initial concern due to their ease of damage. But non-friable asbestos containing materials are not necessarily safe. The forces or conditions of usage that come into intimate contact with most non-friable asbestos containing materials are substantially higher than finger pressure. Because of this, non-friable asbestos products can and do release substantial quantities of free asbestos fibers into their environments as well. During normal usage, initially non-friable products slowly change into a quasi-friable condition. Asphalt asbestos floor tiles are typically worn down through a sanding action of the normal floor grit under foot traffic on such floor coverings. Asbestos shingles, siding and roofing materials are eroded through drying, weathering, embrittlement, acid rain leaching and other deteriorative changes to their binder matrix resulting in release of asbestos fibers ("chalk dust") when simple contact is made with their surface or when the wind blows across them. Unfortunately, most government regulations treat such products with much less care than they do when addressing more friable products. Confusingly, the Modern Greek word �������� means quicklime. Strong concerns about the health hazards associated with asbestos had been described many times over the years. As early as 1898 the Chief Inspector of Factories of the United Kingdom reported to Parliament in his Annual Report about the "evil effects of asbestos dust". He reported the "sharp, glass like nature of the particles" when allowed to remain in the air in any quantity, "have been found to be injurious, as might have been expected" (Report of the Select Committee 1994). In 1906 a British Parliamentary Commission confirmed the first cases of asbestos deaths in factories in Britain and recommended better ventilation and other safety measures. In 1918 a US insurance company produced a study showing premature deaths in the asbestos industry in the United States and in 1926 the Massachusetts Industrial Accidents Board processed the first successful compensation claim by a sick asbestos worker. Many American injuries from asbestos exposure came from shipbuilders working during World War II. The fine asbestos fibres are easily inhaled, and can cause a number of respiratory complaints, including a potentially serious lung fibrosis called asbestosis. Exposure to asbestos has also been determined to cause a very serious form of cancer, mesothelioma, that occurs in the chest and abdominal cavities. This aggressive disease is improperly referred to as a lung cancer, as the malignant cells are derived from the mesothelium, a tissue found on the inner walls of the chest and abdominal cavities and on the outer surface of the lungs rather than in the lung itself. When inhaled, asbestos is carcinogenic (i.e. promotes cancer). In the United States alone, it is estimated that ten thousand people die each year of asbestos-related diseases, such as mesothelioma, asbestosis, lung cancer, and gastrointestinal cancer. Asbestos has a synergistic effect with tobacco smoking in the causation of lung cancer.